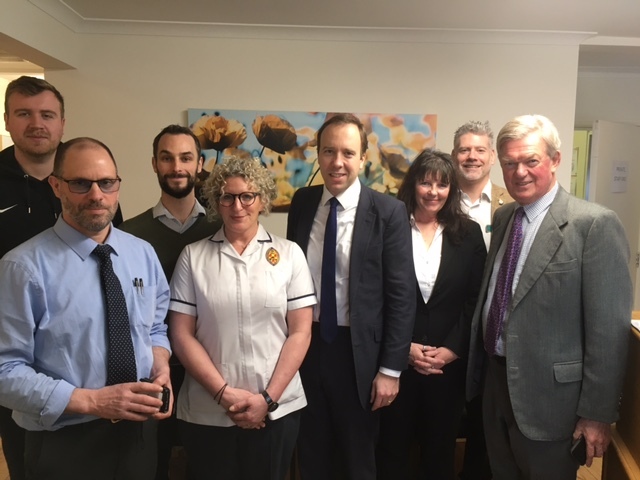 This was the moment when the Member of Parliament for Bosworth, David Tredinnick, and the Secretary of State for Health and Social Care, Matt Hancock MP, visited Burbage House Health Clinic. Part of my working time is spent at Burbage Health Care, where I am often in residence as one of their therapists. Amongst the attendees was a representative from the Hinckley and Bosworth Borough Council, Simon Jones. As the manager of cultural services, Simon is spear-heading wellbeing initiatives within the council. The occasion marked a surge of interest in the works of health care providers outside the NHS. It’s important to realise why some therapies are not officially recognised as being effective. Far from being proven ineffective, it’s more to do with how therapies are researched. Some things just aren’t measurable within the confines of the clinical parameters required. However, many hundreds of past clients would absolutely stand by the benefits that they have received within the various therapies available. With this in mind, David Tredinnick has steadfastly promoted complementary medicines for a number of years and, I believe, rightly so. In the above photo, therapies provided by the team above include: acupuncture, Chinese Herbal Medicine, physiotherapy, sports massage, chiropractic, podiatry, hypnotherapy, BWRT and Indian Head Massage. Complementary wellness, the mind and body connection, mindfulness, meditation – all of these things are growing in popularity and common interest. We all need to remember that this rich diversity of help can restore health and happiness to our frazzled selves. We need to be mindful to allocate a budget not just for hair, nails, tanning, extensions and drinking, but to put aside a little for our wellbeing too.